TAORMINA, Italy, May 28, 2017 (ENS) – Leaders of the world’s seven wealthiest democracies have failed in a concerted effort to persuade President Donald Trump to endorse the landmark Paris Agreement on Climate. This accord received near unanimous approval by world governments at the UN climate summit in Paris in 2015 and entered into force on November 4, 2016. To date, it has been formally joined by 147 countries, including the United States, under President Barack Obama. “Understanding this process, the Heads of State and of Government of Canada, France, Germany, Italy, Japan, and the United Kingdom and the Presidents of the European Council and of the European Commission reaffirm their strong commitment to swiftly implement the Paris Agreement, as previously stated at the Ise-Shima Summit,” they said. “We are bound together by our shared values of freedom and democracy, peace, security, the rule of law, and respect for human rights. 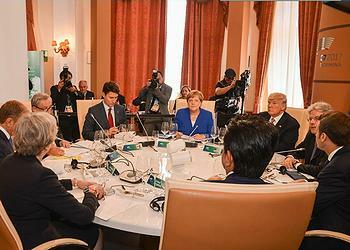 We are determined to coordinate our efforts in promoting the rules-based international order and global sustainable development,” the G7 leaders stated. “Our common endeavor is to build the foundation of renewed trust, both towards our governments and among our countries,” their communique states. But at the tense meeting, trust between the U.S. president and the other leaders was not renewed. 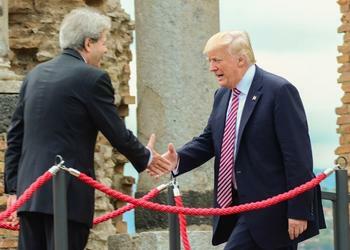 In Taormina, Trump said he would not yet make a decision about whether the United States would remain in the Paris Agreement, or withdraw from it. France’s new President, Emmanuel Macron, said he told Trump that it was “indispensable for the reputation of the United States and for the Americans themselves that the Americans remain committed” to the 2015 climate agreement. “The entire discussion about climate was very difficult, if not to say very dissatisfying,” German Chancellor Angela Merkel told reporters at the conclusion of the summit on Saturday. “Here we have a situation of six against one, meaning there is still no sign of whether the U.S. will remain in the Paris accord or not,” Merkel said. A U.S. withdrawal from the 197-nation Paris Agreement could undermine international efforts to limit climate change. The United States emits the most heat-trapping greenhouse gases after China. “I am not going to lecture another country on what they should do. Nor would I have my positions determined by anyone outside Canada,” Prime Minister Justin Trudeau told a press conference where he announced Canada will host next year’s G7 meeting at the Le Manoir Richelieu in La Malbaie, Quebec. “We respect the President’s choice to reflect further on [his] engagement on climate change and the Paris accord,” said Trudeau. Trudeau has urged Trump to stay in the accord, arguing that advances in green technology would create millions of new jobs in America. “You cannot build a strong economic future for your children unless you are protective and mindful of the environment,” Trudeau told reporters. The Paris Agreement charts a new course in the global climate effort. It builds upon the UN Framework Convention on Climate Change, and, for the first time, brings all nations into a common cause to undertake ambitious efforts to combat climate change and adapt to its effects. The agreement aims to strengthen the ability of countries to deal with the impacts of climate change. To reach these goals, appropriate financial flows, a new technology framework and an enhanced capacity building framework will be put in place, supporting action by developing countries and the most vulnerable countries, in line with their own national objectives. The Paris Agreement also provides for enhanced transparency of action and support through a more robust transparency framework. The Paris Agreement requires all Parties to put forward their best efforts through “nationally determined contributions,” or NDCs, and to strengthen these efforts in the years ahead. This includes requirements that all Parties report regularly on their emissions and on their implementation efforts. In 2018, Parties will take stock of the collective efforts in relation to progress towards the goal set in the Paris Agreement and to inform the world about their preparation of NDCs. There will also be a global stocktaking every five years to assess the collective progress towards achieving the purpose of the Agreement and to inform further individual actions by Parties.